Joe Biden is old. How old is he? He was born before the Frisbee was invented. Before Velcro. Before microwaves, the polio vaccine, even Mr. Potatohead. Biden is so old that when won his Delaware Senate seat in in 1972, one of his prospective rivals in the 2020 presidential campaign was not yet even born. Biden is 76 years old but would be 78 should he run for president and win. But Biden is reportedly considering a few options that might make what appears to be an inevitable presidential campaign more palatable, especially to young people. “Mr. Biden and his top advisers are considering nodding to the rising next generation in Democratic politics — and elevating an heir — by announcing a running mate early, well before the nomination is sealed. Also under discussion is a possible pledge to serve only one term and framing Mr. Biden’s 2020 campaign as a one-time rescue mission for a beleaguered country, according to multiple party officials,” The New York Times reported on Thursday. Meanwhile, another news outlets writes that Biden’s run will come as a “packaged” deal. “Close advisers to former Vice President Joe Biden are debating the idea of packaging his presidential campaign announcement with a pledge to choose Stacey Abrams as his vice president,” Axios reported. Abrams, you’ll recall, is the 45-year-old African American woman who ran for governor of Georgia but lost in 2018. Her spokesman released a statement on Thursday about the reports. “Abrams continues to keep all options on the table for 2020 and beyond. She has met with over half a dozen presidential contenders to discuss their commitment to voting rights and to investing in Georgia,” read the statement. "Abrams continues to keep all options on the table for 2020 and beyond. She has met with over half a dozen presidential contenders to discuss their commitment to voting rights and to investing in Georgia." Normally, candidates for president do not announce their picks for running mates until just days before their party holds its national convention. Even Sen. John McCain, who was trailing then-Sen. Barack Obama in 2008, did not announce his pick of Alaska Gov. Sarah Palin until just four days before the Republican National Convention. There has already been much talk that Biden would likely pick a young running mate, just as McCain, who was 72 when nominated, did. The names most floated are Robert “Beto” O’Rourke, the 46-year-old congressman from Texas who lost to Sen. Ted Cruz in 2018, and Rep. Julian Castro of Texas, the 44-year-old former Obama Cabinet member who is running for president in 2020, hoping to become the first Hispanic in the White House. 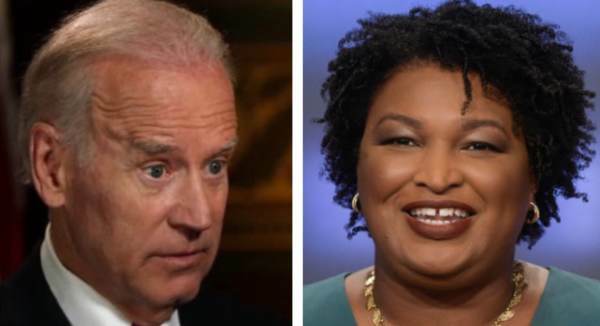 Biden reportedly met with Abrams on Thursday “to discuss her next political step – and presumably his, too. The sit-down between the Democrats came as each are weighing 2020 bids that could intersect,” the Atlanta Journal-Constitution reported Thursday. “Two of Mr. Biden’s closest advisers, Steve Ricchetti and Mike Donilon, have floated both possibilities in recent weeks. And they have been egged on by some Democratic lawmakers, who have urged the Biden associates to strongly consider the one-term pledge to immediately defuse the question about his age,” The Times wrote. Seems a bit desperate for a front-runner, doesn’t it?